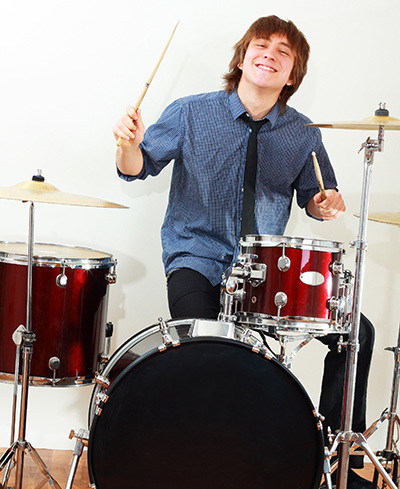 Have you always wanted to be a drummer? Vivaldi Music Academy offers the best Percussion lessons in Houston through innovative, engaging, and individually tailored lessons to students of all levels. Our percussion faculty teach various styles including rock, blues, jazz and more. Students starting out will learn about the drum kit and its components, rhythmic patterns and counting measures. More advanced students continue to progress with a wide variety of technical exercises designed to improve your speed and comfort. All drummers are encouraged to bring their favorite drum parts to learn in their lesson. Drum lessons at Vivaldi Music Academy are taught with total musicianship in mind while providing a comprehensive music education that includes theory, ear training, sight reading, technique, and history. Archaeological evidence suggests that around 30,000 years ago, in the Upper Paleolithic era, early man figured out how to stretch an animal skin to make a drum. It only took 29,000 more years for man to arrive at a system for multi-tasking on the instrument: the drum kit. Not quite a hundred years old, the drum kit might be just a kid in instrument years, but it’s long been at the heart of popular music. It’s served not just as a time-keeping machine but as a tool for virtuosic expression, from the bombastic jazz of Buddy Rich to the prog-rock stylings of Rush’s Neil Peart to the impeccable funk rhythms of Clyde Stubblefield. The modern drum kit is what allowed players like Max Roach to play polyrhythms at racing tempos and, in the 1940s, develop a highly complex new jazz idiom: bebop. They began using the ride cymbal to delineate time in a swinging way, and this pattern, which you no doubt know, is still the basic rhythmic unit of jazz.